I’ve always enjoyed trekking. I like exploring nature and see the views, especially mountainscapes. When I was a kid though, there was a time that I felt icky whenever my shoes would get muddy after going through mud puddles. Then later, I just decided to “enjoy” getting mud all over my shoes and even my legs and ever since I made that decision, it made me realize how much I have gained for doing so. But as my priorities have changed over time, especially when I got married to Sigrid Says and eventually had kids, I no longer have the time to go on nature trips as much as I did before as most of our free time apart from work is spent with the kids. While I love my family, I do long to go on nature trips, so I hope that someday when the littlest one is a bit older, maybe we can go together as a family. Atty. Aldean Lim, Salomon athlete, talks about the basics and advantages of trail running. 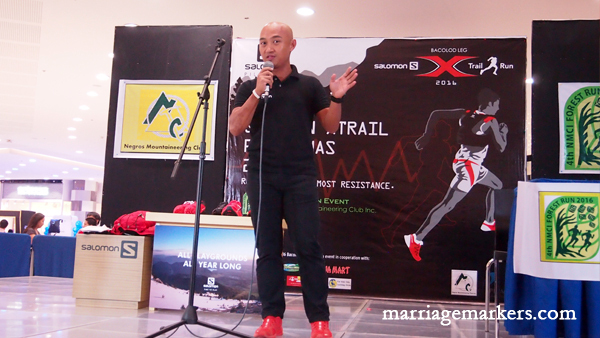 Last weekend though, I listened to a talk by Salomon athlete Aldean Lim during the Salomon X-Trail Run 2016 Bacolod leg pre-event at the SM City Bacolod, something had awakened inside me. Listening to a talk on trail running has awakened my curiosity to the sport. Is it inviting me to consider it a fitness option? Maybe the wifey and I can do this in the near future? Aldean Lim, an Ilonggo who is a practicing lawyer in Manila, has made it his life and passion to run trails. He prefers it than running on flat pavements in the metro. And I can understand why. 1. Use trail running shoes. The most important tool in trail running is the shoes. 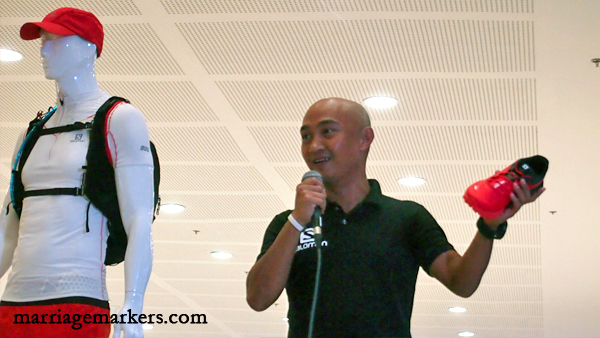 Lim says he trusts Salomon running shoes because of their features that can help you adapt to different terrain. It is important to wear trail running shoes by Salomon to prevent injuries because they were designed specifically for the different terrains. 2. Choice of clothes. “There is no bad weather, just bad choices of clothes,” Lim says. He advises about wearing clothes that adapt with different weather conditions (wet or scorching hot) and still keep you light and comfortable. Choose the right clothes for running. They will greatly help in your efficiency as a runner. 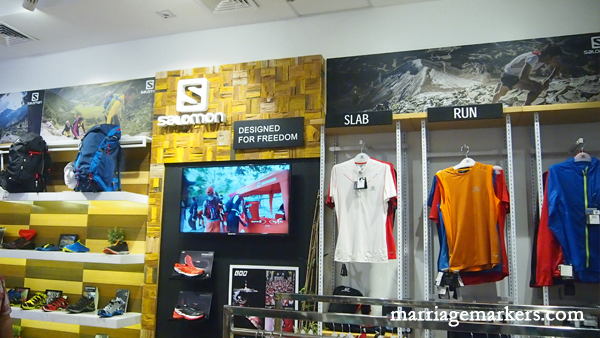 In Bacolod, visit the Salomon store at the 2nd floor of SM City Bacolod, north wing. 3. Nutrition. The most important thing about running is hydration, so you need to have enough liquids with you. On a trail run, you will most likely not encounter a convenience store, so you have to be prepared before going. For long runs that last several hours to a couple of days, you will need to bring more energy and nutrient foods like energy bars, gels, and electrolytes. 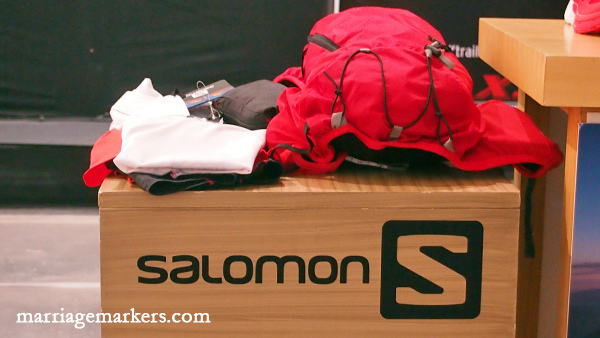 Salomon has running vests and other gear that will help your run easier. 4. Gear. Salomon has vest that was engineered for runners. It can carry basic necessities, especially food and drinks. It has a built-in water bottle and straw so that you don’t have to stop to take out your water bottle just to drink. You only have to sip from the straw that sticks out on the side. Salomon has trail running shoes and gear that were engineered to give trail runners the most comfort whether for short or long runs. 1. Nice views. When you run trails, you get to see the nicest views of the countryside. Atty. Lim has traveled many countries spanning many continents–Asia, North America, and Europe in order to compete. He has seen some of the most magnificent peaks, pastures, hills, valleys, forests, and even rivers. But even here in our country, we will appreciate nature more if we are constantly exposed to it. Lim says that he does this during weekends to break the monotony of living in the metro with its urban jungle. 3. Being present. Being on the trail means that you have to be alert about your surroundings. You need to focus because the terrain is different all the time. You cannot be on auto-pilot like on a pavement run where you can plug in your earphones and get lost in the music while you run. On the trail, you need to watch out for rocks, loose ground, slippery mud, even branches sticking. And there are so many more obstacles. So you are forcing yourself to be focused on the moment. 4. Prevents injuries. With pavement running, your feet only have the same motions so they are prone to be injured by repetitive motion. With trail running, you run, sprint, hope, skip, side step, and many other different steps just to move forward in the race. Lim also adds that trail running is “kinder on the knees” unlike pavement running because the surface is softer and therefore has lesser tension. 5. Solitude and peace. When you run on a trail, even with some friends, it is still quiet. Plus you get to commune with nature and at the end of your run, you can rest and take a retreat, to meditate, and think. It is a good exercise to clear the mind. About 300 trail running enthusiasts of Bacolod City have already registered for the the Salomon X-Trail Pilipinas Run 2016 that will be held in Talisay City, Negros Occidental on November 27, 2016. Now on its 3rd year, the Salomon X-Trail Pilipinas Bacolod leg is going to have the same brand of technical trail racing that Salomon trail runs are known for. The X-Trail includes a variety of terrain and river crossings, downhill and uphill treks, forest canopy covers, grassland hikes, and of course, spectacular views of both Negros and Panay Islands, including the tree planting site of the Negros Mountaineering Club–the facilitators of the event. 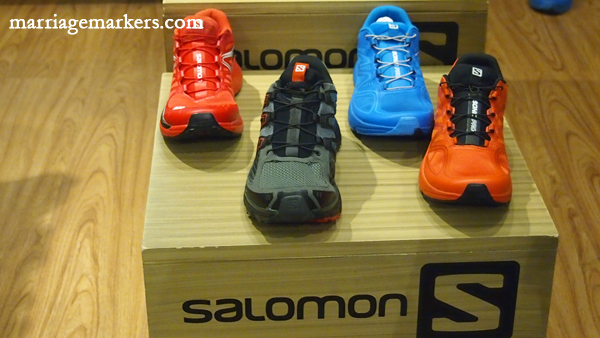 Registered runners can get a 20% discount on regular prices running shoes at the Salomon store in Bacolod. Starting line is at 720 meters and it goes down to a low of 520 meters, with the highest point being 960 meters. With two distances to complete–the 17km and the 12.5km.–the Salomon X-Trail Run 2016 is the only trail race in Western Visayas that offers an authentic trail run experience. Runners can surely expect technical challenges along the route but with the right gear and shoes, everything will become easier. The assembly time is 5:00AM at Kampo Hiyang-hiyang, Campuestohan, Talisay. Gun start will be at 6:30am for 17km and 6:45am for 12.5km. Winners will receive cash prizes while some Salomon Running shoes will also be raffled off.